Stratford Town Walk01789 292 478work Guided WalkMake the most of your visit to Shakespeare's Stratford upon Avon. 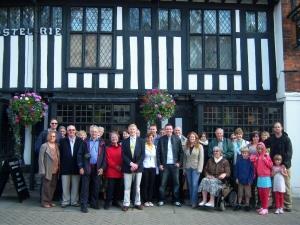 Join the Pride of Stratford, award-winning guided walking tour - 365 days a year - yes even Christmas Day! Discover Stratford and its fascinating relationship with William Shakespeare. See the Shakespeare town houses (Birthplace, New Place, Hall's Croft), the Royal Shakespeare Theatres, River Avon, 15th century timber-framed buildings, Shakespeare's School and visit the Guild Chapel to see medieval wall paintings (free entry) and Holy Trinity Church to see Shakespeare's grave (small fee to the Church on the day). Hear fascinating stories of fire, flood, plague, old-fashioned sayings, medieval cures and Stratford's rich history, all wrapped up in Shakespeare's life and story. Entertaining, informative. Accessible. Dogs are welcome! Duration 2hrs (approx). No need to book (unless a group of 10+), just turn up by the swan fountain on Waterside. Near the Royal Shakespeare Theatre and opposite Barnaby's fish & chip shop on the corner of Sheep Street. Ticket includes tear-off vouchers to obtain discounts at over 30 shops, restaurants, pubs and attractions. Eg the MAD Museum, Butterfly Farm, 20% off entry to the Shakespeare Houses and 50% off entry to Shakespeare's School. Visit website for updates and more info. Make the most of your visit to Shakespeare's Stratford upon Avon. Join the Pride of Stratford, award-winning guided walking tour - 365 days a year - yes even Christmas Day! Adults £6. Over 65's and students £5. Children (under 16) £3 Under 8's FREE!